FC Barcelona hosted french champions Paris Saint Germain in the Champions League round of 16 second leg on Wednesday night at Camp Nou. Having lost the first leg 4-0 in Paris, Barcelona need to score 5 without conceding and they started off with exactly what they needed an early goal. Luis Suarez pocked home from close range as PSG defense was caught off guard. Iniesta backheel deflected off Kurzawa in the back of the net as Barcelona lead 2-0 at the break and reduced the aggregate deficit to half. Second half started with Messi scoring the third but Cavani’s goal looked to have sealed the tie for PSG. But Neymar brace and a late goal by Roberto secured one of the greatest champions league comeback in history. 40′ 2 – 0 (Own goal) Layvin Kurzawa failed to clear the line as Iniesta’s back flick deflected off Kurzawa in the back of the net. 50′ 3 – 0 Lionel Messi scores from penalty spot to make it 3-0 and get Barcelona within 1 goal of PSG on aggregate. 62′ 3 – 1 Edinson Cavani scores midway through second half to put PSG back in command on away goals. 88′ 4 – 1 Neymar scores with incredible freekick to make it 4-1 on the night. 90′ 5 – 1 Neymar scores from penalty spot after referee gave away an harsh penalty when Suarez went down on minimum contact. 90′ 6 – 1 Sergi Roberto won the tie for Barcelona with virtually the last kick of the game. Barcelona and Paris Saint Germain has meet 6 times in champions league since 2013 and Barcelona knocked out PSG twice in knock stages, most recently in 2015 thanks to a 5-1 aggregate win en route to becoming 2015 champions league winners. PSG has struggled against bigger teams in knockout stages and this season they are even finding it hard to cope with extra competition in their french league. Barcelona on the other hand are pretty solid in cup competitions but trail Real Madrid in league. 18′ 1 – 0 Angel Di Maria scored with a stunning freekick in jsut 18th minute of the game to put PSG 1-0 up. 40′ 2 – 0 Julian Draxler scored his fifth goal from the club having signed in January as PSG went into the break with a two goal lead. 55′ 3 – 0 Angel Di Maria scored again just after the break to really hurt Barcelona. On a counter attack, Di Maria produced another superb shot from edge of the box to put dagger in Barcelona’s hearts. 72′ 4 – 0 Edinson Cavani put the game to bed (and maybe the tie) when another counter attack allowed PSG to scored fourth of the night. 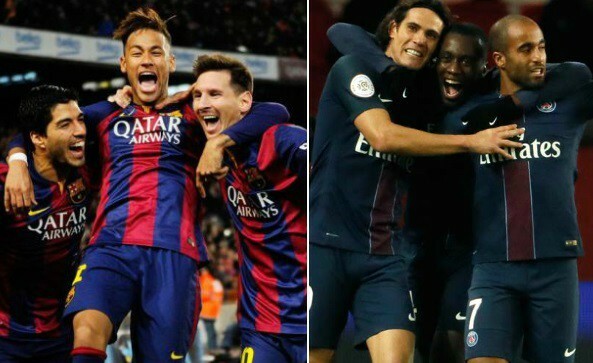 Last time these two meet at Parc de Princes in champions league knockout stages was that impressive 3-1 win for Barcelona which ensured their passage to next round. Team News & Lineup: Barcelona will start with their historic trio of Neymar, Suarez and Messi upfront while Ivan Rakitic, Iniesta and Busquets should take the central midfield roles. Barcelona do have issues in back four selection but we can expect Sergi Roberto, Pique, Samuel Umtiti and Jordi Alba to start in defense while Javier Mascherano to miss out due to hamstring injury. While Marc Ter Stegen to keep the goal. PSG on the other hand has Verrati back in the starting lineup while Edinson Cavani to keep his place in attack after incredible form which saw him already notched up 25 league goals. This is how I expect both teams to lineup. Match Predictions: Paris Saint Germain has improved alot after difficult start to the season and with all key players fit and raring to go, they will pose a real threat for this fragile Barcelona side who are great going forward but do have defensive issues. Cavani in the form of his life will hold the key for PSG to get a positive result and in all fairness PSG must win the game and not concede to have a chance of qualification as the second leg will be in Camp Nou.